The Racor RK 11233 is a 1/4″ NPT bracket mounted gauge, used in an instrument panel installation. The gauge pressure readings range from 0 to 30 in Hg. The Racor RK 11233 is a 1/4″ NPT bracket mounted gauge. 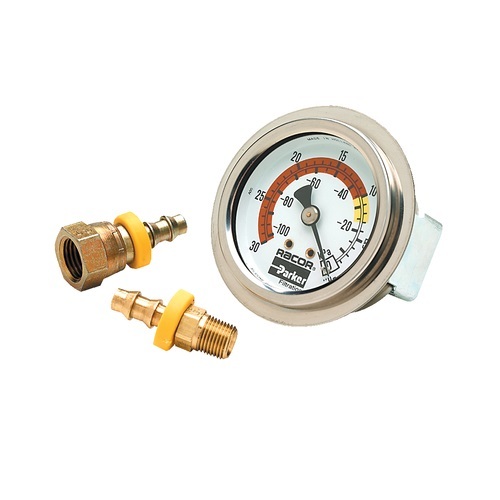 The gauge pressure readings range from 0 to 30 in Hg. This particular gauge is utilized in an instrument panel installation. For all applications. : Includes silicone filled gauge with 2 fittings. 1/8” male NPT x 1/4” (#4) and 1/4” swivel x 1/4” (#4) hose barb. 1/4” (#4) hose not included.